There are a few reasons why your goldfish are not swimming around in the optimal water condition. First, figure out what the underlying problem is. You can only fix cloudy water after you’ve eliminated the cause. Even though a fishbowl is very cute it is hardly the appropriate home for a goldfish. Besides being too cramped, the water in a bowl will quickly get contaminated. Consider that a fish must get rid of bodily waste every day. It is swimming around in its own waste for several days unless you are cleaning out the bowl twice a day. 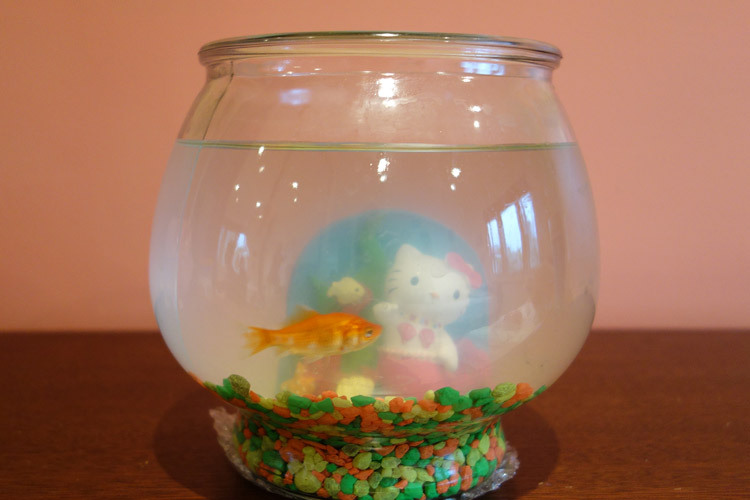 A goldfish who lives its life in a bowl will have a short life indeed. If your goldfish lives in such a small, unaerated system, this may be the reason behind the cloudy water. A goldfish must have a proper home, meaning at least a 10-gallon tank. Along with the tank, purchase a good filtration system and pump. These days, tanks and starter kits can be purchased for under $100 and they often can be bought used. You may be thinking that a tank will be more difficult to maintain, but in the long run it will save you time. A bowl must be manually cleaned frequently. A tank with a pump and filter is virtually self-cleaning. Aside from changing the filter once a month, a tank needs only to have a partial water replenishment once every week to two weeks. Cloudiness is often a sign of unhealthy water, but don’t be alarmed – most problems can be resolved. Recently filled tanks will go through an acclimation process. The filtration system may produce bursts of cloudiness from the newly dissolved chemicals. Unwashed toys and decorations will also cause murky water so make sure to rinse them well before furnishing the tank. Goldfish are relatively easy – they thrive at the pH levels of normal tap water. Therefore, you don’t really need any fancy chemicals or additives to give them a healthy environment. However, you still want to make sure the filtration system is working and has gone through a few cycles before placing your goldfish in the tank. Bacterial colonies will form in a new tank and take some time to become invisible to the naked eye. If cloudiness stems from the new bacteria, rest assured the cloudiness will clear up on its own. Bacteria will rest on items in the tank and it will also grow on the filter in due time. Because they are important to a well-balanced environment, do not change or clean the filter at the same time you clean the bottom of the tank. Doing so will upset the delicate equilibrium causing harmful bacteria to grow out of control. Another possible cause to unhealthy water is the number of animals residing in one tank. With just a couple of fish, the recommended frequency is to change 10-15% of the water once every week to two weeks. With more fish,or a smaller tank, the recommended frequency and ratio will increase. When you don’t follow the recommended guidelines, this means that your fish are swimming around in their poop and uneaten, decaying food. When you swirl around the water or the decorations, you will dredge up this sediment from the bottom and it can cause temporary cloudiness. For recurring problems with cloudiness, you’ll want to increase the frequency of changes to no less than once per week, cleaning out at least 20% of the volume. A common culprit of murky water is too much algae. This is easy to spot – the water will have a greenish hue to it. It’s also easy to fix – plant matter uses sunlight to make chlorophyll. Simply shading the tank from sunlight will often eradicate the overgrowth of algae. Too many nutrients in the water will also feed an algae problem. It’s important that you feed your fish only the proper amount so that excess food is not left to decay. There is much controversy on the difference between flakes and pellets. Whatever you decide to feed them, monitor their intake and try to clean out uneaten food as soon as they are done eating. Monitoring your fish will ensure that the faster fish aren’t eating the entire food supply and that leftover food isn’t sustaining the growth of unwanted algae. If you are to own a fish, you must expect that cleaning the tank will be part of your normal routine just as cleaning your own bathroom and kitchen hopefully is. You can’t escape it. To not have the necessities for a healthy tank environment is to sentence your goldfish to an untimely death caused by a painful disease. Goldfish, although easy to take care of, are susceptible to wasting diseases and bloat. They have fussy bodies and digestive systems. Along with a good diet, a suitable water environment will maximize their quality and quantity of life. Can You Overfeed a Goldfish? How Do Sea Monkeys Come to Life?